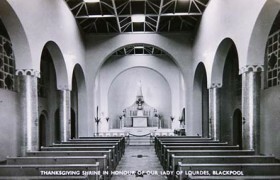 The Shrine of Our Lady of Lourdes was opened in May 1957 as a thanksgiving offering for the preservation of the Roman Catholic Diocese of Lancaster during World War II. It is a rare and preciously intact example of the architectural work of the distinguished Francis Xavier Velarde (1897-1960). Unlisted until 1999, the building was categorised in Grade II* at the request of the 20th Century Society after a proposal to demolish it. 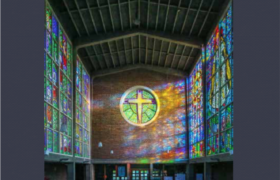 The chapel occupies a prominent site in residential Blackpool and comprises an imposing narthex, a tall pitched-roof nave, aisles, apsidal chancel and ‘transepts which form a side chapel on the south side and vestries etc. on the north. 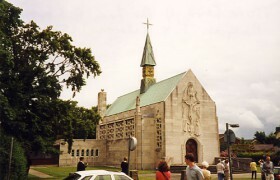 With its facing of white Portland stone, copper-covered roof and fleche glittering with gold bands the chapel can be seen far across Stanley Park. The exterior is gloriously confident and individualistic, made all the more impressive by sculpture by David John, now in his 70’s, brilliantly integrated into the whole. The composition of the Blessed Trinity with Angels above the main door is remarkable for its scale and emotive force, contrasting with its conventional surroundings. Windows appear like elaborate piercings in the stonework. They are formed into horizontal bands which light the nave and are visually marked by sculpted saints standing high on pinnacles at each aisle corner. Vertical bands of windows accentuate the narthex. The glass is tinted soft blue which, set against the white glass, gives an interesting pinkish glow inside. Within, a lacquered bronze glazed screen divides nave from the narthex. It is here that the impact of early Christian symbolism on Velarde’s thinking is vividly apparent. The cylindrical nave columns are studded with gold mosaic and alternating geometrically decorated capitals. Mosaic crosses decorate the travertine of the sanctuary in a bold, unexpected yellow. The sanctuary rails are of a bronze patterned design. The sanctuary is emphasised by marble steps, a stone reredos and an altar enriched with candlesticks and an impressive blue enamelled altar cross. Above floated a coffered ceiling of a vivid blue and gold (now with red added) and walls of cool grey. 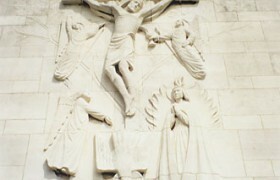 There are elements of jazz modem and art deco so that the result was “hardly historicist but exhibited a highly individual expressive modem interpretation (although by no means strictly Modern) which was liturgically suited to Roman Catholicism of the post-war years” (Bronwen Edwards). The Historic Chapels Trust (HCT) acquired the chapel from the Diocese of Lancaster in 2000 following the Director’s visit on a 20th Century Society tour of the North West, when the chapel was facing an uncertain future and some items of furnishing had been removed. Fortunately these have been secured. The immediate environs of the chapel are also now in HCT’s ownership. 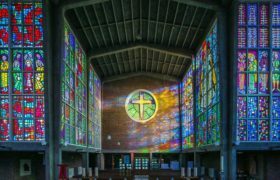 HCT has commissioned Peter Hatfield, architect, to draw up a repair and upgrading scheme in which all the original furniture and fittings will be reinstated including the altar cross, monstrance, candlesticks, lamps, holy water stoops, pews and chairs. 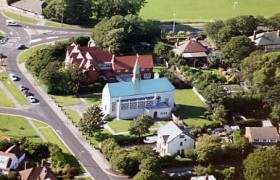 The Trust will make the chapel accessible to visitors and available to the community for a range of activities such as concerts and exhibitions as well as occasional services of worship.